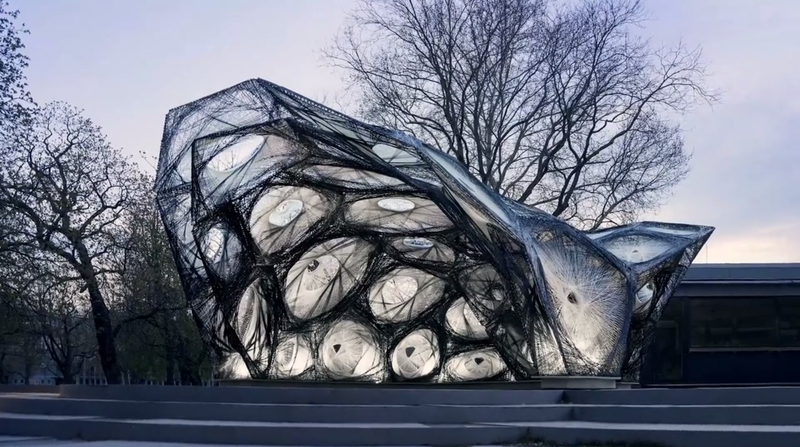 This robotically woven carbon-fiber pavilion imitates the structure of a beetle shell using weaving robots. The 538 square foot (50 square meters), 1307 pounds (593 kilograms) double-domed structure has web-like walls and ceilings that make it look as it was made by xenomorphs. This is how they made it. "The project presents a novel approach to fibre-composite structures in architecture. It is based on the development of a robotic fabrication process for modular, double layered fibre composite structures, which reduces the required formwork to a minimum while maintaining a large degree of geometric freedom. This enabled the transfer of functional principles of natural lightweight systems to architectural structures." The project was developed by academics from the Institute for Computational Design (ICD) and Institute of Building Structures and Structural Design (ITDK) at the University of Stuttgart. These are the same people who previously made these two other biological structures: A pavilion based on a lobster's exoskeleton and in a structure modeled on a sea urchin's skeleton.